First off I’d like to start off by saying that every single dog that I have ever owned in my entire life until now has left a very special memory mark in my mind and heart. Each one had its own unique personality and character and even today I could sit down and write a biography on the quality time I spent with them but as with human friends there is always that special one that stands out and that particular one was my dog Dylan. All of the dogs that I owned were dear friends of mine but with Dylan it was a little different. The bond between us was different and it was almost as if he was born just for me. It started one day when I was looking through the classified section of a local newspaper. I ran across an ad that caught my attention. 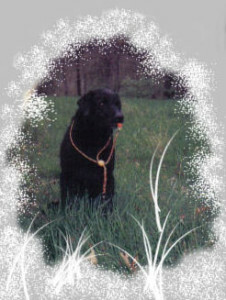 It pertained to a litter of black Lab pups that were available of pure English breeding. I made a phone call to inquire about them because was very interested in the English bred Labs. When the lady answered the phone I was even more curious. She had a very strong English accent. Through our conversation I found out that the parent dogs were brought over from England, and the sister to the mother of this litter was actually owned, and Field Trialed by the Queen. WOW! I had to go see these puppies. When we arrived we were immediately greeted by her adult dogs. They seemed to welcome us along with their owner. We met all the dogs, and after a very pleasant afternoon we found out that Carol has her adult dogs meet potential buyers before she brings the pups out. If the adult dogs feel anything threatening her puppies are not available. Carol said she trusted the instinct in her dogs more than she trusted her own. I really liked this woman. For her it was all about the safety and wellbeing of her puppies and she wanted to make sure her puppies were going to the right homes. After watching the pups play there was one that really caught my attention. He sat and watched the older dogs retrieving training bumpers that Carol was throwing for them. I felt he was grasping everything he saw, and he was storing it in his memory. It was quite impressive to me to see this 11 week old puppy sit so calmly and watch the adult dogs work. Our visit came to an end, but we left to head home with our new little black Lab puppy in my arms to add to our family. Our new addition came to be called “Dylan”. As time went on he met, and went beyond my expectations of him. Since he was as calm and obedient as he was, I took him with me everywhere I could. He would lie on the seat next to me, and seemed to enjoy the trips we took, and the bond between he and I grew stronger every day. He went training with us every time we went. When it came his turn to work his energy exploded. It was as if he was fueled by the pleasure he saw in me each time he returned with a retrieve. IT WAS INCREDIBLE. He was so quick to make a retrieve, and very athletic on his feet so much that you could hardly hear him running. When he returned from the retrieve, his whole body seemed to smile. That’s the best I can describe the way he looked. It was as if he was not only born for me but born to please me as well. Time went on, and when he was around 5 months old there seemed to be something causing him some discomfort. When, after lying down for a while, he would whine when he got up. This was not normal, and greatly concerned me so I took him in for X-Rays. The results floored me. Dylan had had a broken neck. After having a specialist look at the X-Rays I was told that this was something that either happened as he was born or it happened shortly after he was born possibly due to the way his mom picked him up. The Dr. told me it was an old injury, and the injury had healed leaving two vertebrae fused together. I was told surgery could be done later, after he stopped growing, to fuse 2 more vertebrae to the ones already fused due to the break. He also stated that Dylan would never be able to compete in trials because he would not be able to pick up a duck. I really felt horrible about this little dog who I had become so very fond and attached to, and who had so much drive and desire to please, would have to quit doing what he was bred to do, and worst of all what he seemed to want to do because he knew it pleased me. I refused to let this happen to either of us. He was put on aspirin for pain and Yucca tablets to relieve inflammation, and he continued to go training with the other dogs, and he loved it. After he reached 1 year of age and his bone structure reached its max I started weaning him off of the aspirin and Yucca. HE DID GREAT! I guess keeping him training with the other dogs, and his muscle tone staying up is what did it. His neck was still not totally right, and you could tell this by the way he would turn his head certain ways. But as far as his problem preventing him from doing what he loved to do, it did not. As a matter of fact Dylan was our first Hunting Retriever Champion. Not only did Dylan get his Championship, and make me the 1st woman in our club to earn this title, but the two of us as a team beat the odds that the Dr. had given him when he was 5 months old. Dylan continued to go everywhere possible with me and very seldom was he ever on a lead. He was like a piece of Velcro. I knew just how to walk, turn, how long to leave a door open, everything. Dylan was always there. When people saw me they saw Dylan. They didn’t even have to look down, they knew he was there. He even went to work with me every day, and clients knew him as well as they knew me. Occasionally someone would stop in just to see him or bring him a treat. Dylan was unique, and he won the hearts of many. I knew this dog would do whatever it took to be by my side. I was his world and he was my very best friend. The years I spent training were very rewarding to me but I had to make sure that I had his training times planned out perfectly, with no errors because he was so intelligent he would grasp things so easily that I had to be right in how I was teaching him the first time. There was no room for error. I often stated that if Dylan was a student in school, he could be straight A’s without opening a book. No brag just fact, that’s exactly how he was. As time and years went by Dylan and I were both happy to have each other in our lives. We were a pair; a team and where you saw one you saw the other. Such a great life and fun times in the Retriever world I wanted it to never end, but as with everything unfortunately it would. Dylan became a part of my life when he was 11 weeks old and when he reached 11 years old I noticed he was losing weight. He was always a very trim, athletic dog but you could tell he was getting thinner. Blood tests were run. It was discovered his kidneys were not functioning like they should, so he was put on a special diet that was designed for this particular problem. I was assured that this was a pretty normal condition for his age. He was put on medication for his condition, and everything seemed to go o.k. for a period of time, but then he started getting sick whenever he would eat. This condition progressively worsened as time went on. Eventually he had no desire to eat, and I had to syringe feed him. He just couldn’t keep anything down. More and more tests were run; I got the opinions of several Veterinarians. I even talked with a pharmacist about his condition in hopes someone would have an answer for the problem. I was scared for Dylan because no one seemed to be able to help us. Dylan was receiving several types of medication, and was receiving IV fluids to try to get him through this. Dylan was very sick, and I knew it, but neither one of us was going to give up. He still went to work with me every day. Even when he was weak to the point he could hardly walk I carried him. His look told me he was not ready to give up, and I definitely was not going to give up on him. He was always there for me when I needed him, and no matter what, I was going to be there for him. At night I was afraid to go to sleep for fear that he would need me. When I would wake up in the morning realizing I did fall asleep, I was afraid of what I might find. Everyone who knew the two of us was very concerned for both of us. One Vet who had been seeing Dylan even sat on the ground in my yard and assured me that I was hurting worse than Dylan. For me to hang on with hopes was not hurting Dylan. I could take the pain to help him I just didn’t want him to suffer due to my selfishness and not wanting to give him up. I always had hope that tomorrow would bring the answer and cure for his illness. Unfortunately tomorrow never came. After 6 weeks of pure HELL I lost my best friend. I was literally sick. I had to practically learn to do things all over again. Walking, turning, how long to leave a door open, and even keep in mind that I didn’t have to let Dylan in before going to the driver’s side to get in myself. Losing Dylan was a big change in my life. There is a lot more history about this wonderful dog that I could tell everyone about but I’ll just leave the rest stored in my own memory to cherish for the rest of my life. I have thousands of great memories that I will always have but I would give all of them up to just be able to have him by my side again. I can’t change any of this but he will always be with me in memory and thought. This has been very painful for me to sit down and write because he was such a great part of my life for those 11 years and the best friend I ever had. I want everyone to know that I have experienced 1st hand the importance of our pets in our lives. Dylan will always be remembered. I will never forget him.